In allowing President Trump’s revised travel ban to partially take effect, the Supreme Court left key questions unanswered and likely opened the floodgates for additional litigation. The test appears to be new and unprecedented in the context of immigration, legal experts told ABC News. 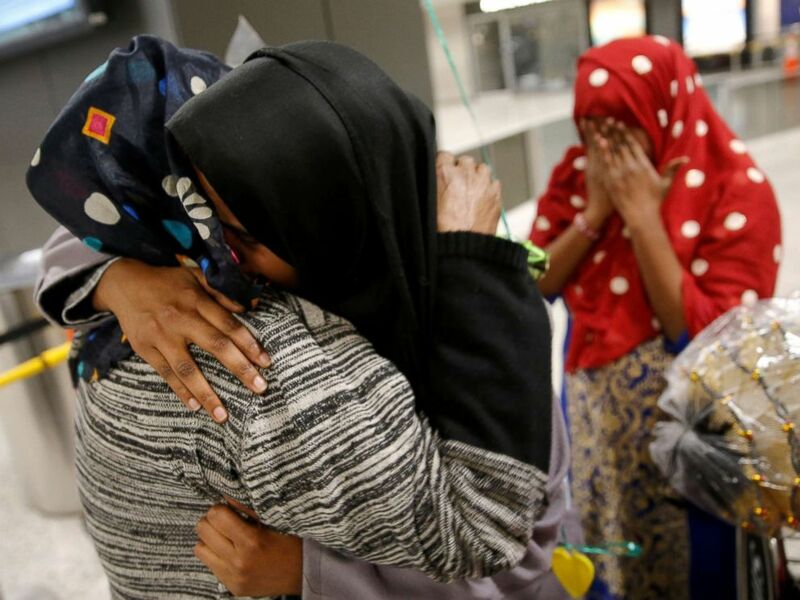 Roodo Abdishakur (2nd L), a Somali national who was delayed entry to the U.S. because of the recent travel ban, is greeted by her mother Zahra Warsma (L) at Washington Dulles International Airport in Chantilly, Va., Feb. 6, 2017. Heather Nauert, a State Department spokesperson, said in a press briefing Tuesday that lawyers for the Justice Department are in the process of determining what qualifies as a bona fide relationship. “We don’t have a definition here at the State Department for that yet. None of the agencies has that definition just yet,” Nauert said. Once they have that definition and some guidance, they will share it with consular officers who review visa applications, she said, and may post it publicly online for visa applicants to see. The court’s ruling provided some guidance on who should be granted entry to the U.S. under the new test: foreign nationals with family members in the U.S., students admitted to American universities, workers with U.S. job offers, and lecturers invited to address an American audience. But, the justices wrote, “not so someone who enters into a relationship simply to avoid” the travel ban. “I suspect there are numerous agency lawyers poring over this opinion with an eye on how to answer these very tricky questions,” Pierce added. 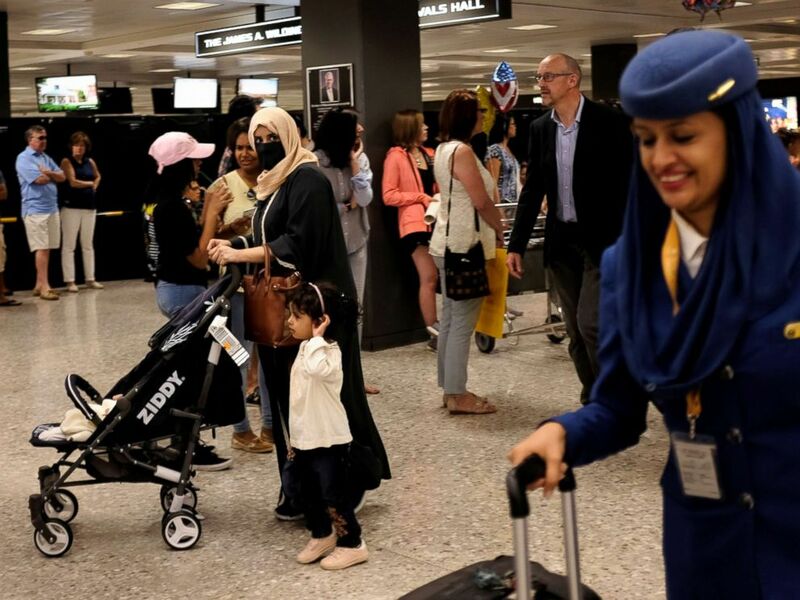 Passengers and crew arrive from Riyadh, Saudi Arabia, at Washington Dulles International Airport, in Dulles, Va., June 26, 2017. “Even in the case of tourism -- if I am coming to visit friends or family -- that could be allowable under the Supreme Court’s language,” Cohen said. Tourist visas from the six countries are already rare, said experts, especially because three of them, Iran, Libya and Somalia, do not even have US embassies. The other three countries covered by the travel ban are Yemen, Syria and Sudan. Three Supreme Court justices – Clarence Thomas, Samuel Alito and Neil Gorsuch – broke with the court’s majority on Monday to warn that the “bona fide relationship” test will be “unworkable.” Arguing that the travel ban should go into effect in full, the justices wrote that this “compromise” “will invite a flood of litigation” over who has “sufficient connections” to the U.S. and will burden administration officials who could face contempt of court if they get it wrong. Among those likely to take legal action are refugee support networks, like the International Refugee Assistance Project, which is already a party to the Supreme Court's case. Betsy Fisher, the group’s political director, told ABC News that under their organization's interpretation, “This will apply fairly narrowly." "There are many groups of refugees who already have close ties to the U.S.,” including those who have family members recently granted refugee status or asylum, Iraqis and Afghans who worked for the U.S. government, and refugees whose cases have been “assured,” meaning they’re in touch with a local resettlement agency already, she said. According to the State Department, refugees already slated for arrival by July 6 have been told to proceed with resettlement. Beyond July 6, “We are not totally certain how that will work because again, this is in flux, this is in progress, this is a new development,” said Nauert. Nauert pointed out that the U.S. is currently close to meeting the 50,000 cap on refugee admissions imposed by the Trump administration and is expected to hit that cap next week. But she said that refugees who prove a “bona fide” connection to the U.S. are not subject to that cap. State Department officials told ABC News on Monday that at this point they do not know how many visa applicants or refugees will be denied entry based on the travel ban and the Supreme Court’s ruling, or how many visas have or will be submitted based on “bona fide” relationships. Monday’s Supreme Court ruling was a temporary stay of two lower court injunctions that blocked key provisions of the travel ban. The Supreme Court agreed on Monday to take the case on the merits and hear arguments in October. But by then, legal experts predict, the case could be moot because the 90 day six-country ban and the 120-day refugee ban will have run their courses.